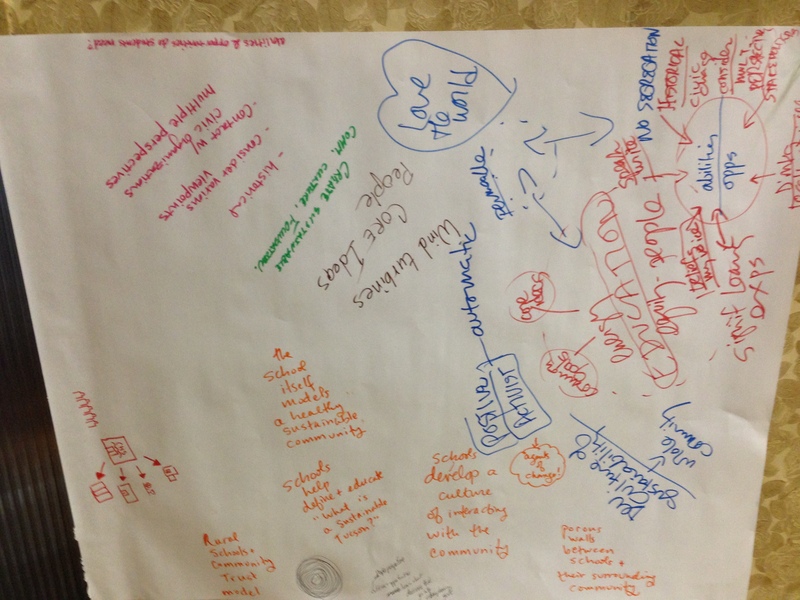 How do we deepen and clarify and make most meaningful the problem which should always sit at the center of service and place-based learning? Saturday nearly forty Arizona educators, mostly Tucsonans, spent what was certainly the most beautiful weekend day in months indoors, at Tucson’s downtown charter City High School, grappling with this question. The day was structured in a remarkably de-centered, inclusive, collaborative way, using Critical Friends Group tuning protocols and other formats to ensure plenty of sharing, reflection, conversation, and feedback. But at the heart was the question, how do we make it real? How do we connect service learning to genuinely meaningful, rich, situated community problems? 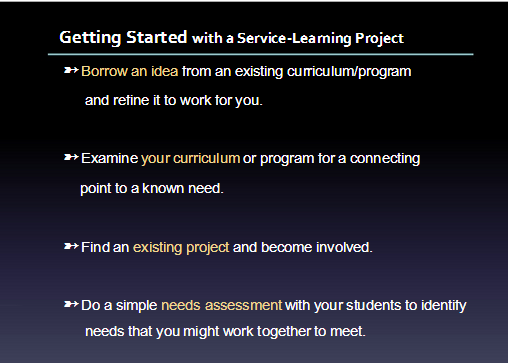 How do we structure the experience of service learning such that students are engaged, empowered, and motivated? How do we advance the possibilities that what they’re doing has an impact that is recognizable and rewarding? 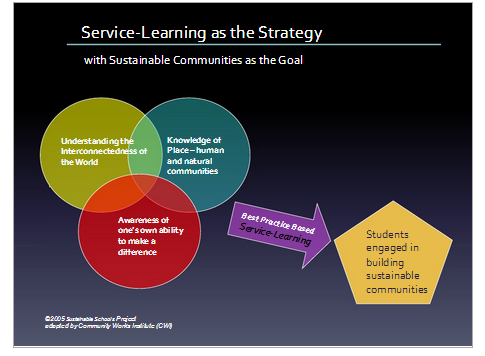 As Joe explained, service-learning is best implemented when deeply rooted in place-based education constructs. As we know from design thinking, problem-finding is key, and the problems we find for students to tackle will be that much better when they are local and immediate, in our own neighborhoods and communities. 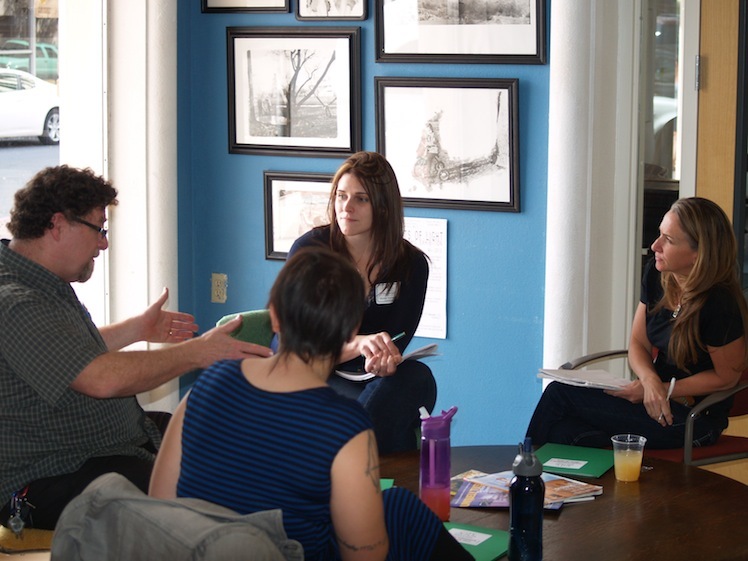 In one small group discussion, an elementary school teacher expressed that common refrain about how to find time/energy/resources to initiate place-based service learning, and counsel came back to him to start small and immediately local. Walk around the block and observe. Invite grandparents who live nearby to come for interviews about their lives. Count the number of plants or animals which can be observed within a 100 yard radius– and then work from these beginnings. Do students understand the need? This comment prompted an important conversation, when a participant pressed the presenter: How? How do you find these kinds of problems, how do you choose issues which so resonate? Brooks shared CWI’s thoughtfully designed Best Practices for Service Based Learning, which are available on its site here, an excerpt of which is below. Service goals that meet a genuine community need are clearly stated. EXAMPLE: Students understand that without their help and care, the nature trail will become unusable. EXAMPLE: Students, teacher, and a community advisor (if one is involved), look at the results of the trail clean-up and determine how successful it was and what more could be done. The learning and service goals stretch participants to develop in new or challenging ways. EXAMPLE: Students are responsible for working in teams, organizing their own tools and jobs, and deciding when they will break to do the map assignment. Selection, design and evaluation of the project is shared by all participants, especially students. EXAMPLE: Students, teacher, and community advisor investigate and discuss needs, and eventually brainstorm a list of tasks to accomplish on the trail. Each shares in the final evaluation. Effective assessment of service learning is both essential and elusive, Brooks explained, and bears close consideration for schools undertaking this important work. He directed our attention to a comprehensive and free book they’ve published on the topic, Service-Learning and Assessment: A Field Guide for Teachers, the first two chapters of which I’m sharing here. Joe also motivated the audience with a useful set of ways to get started or take next steps with service learning. 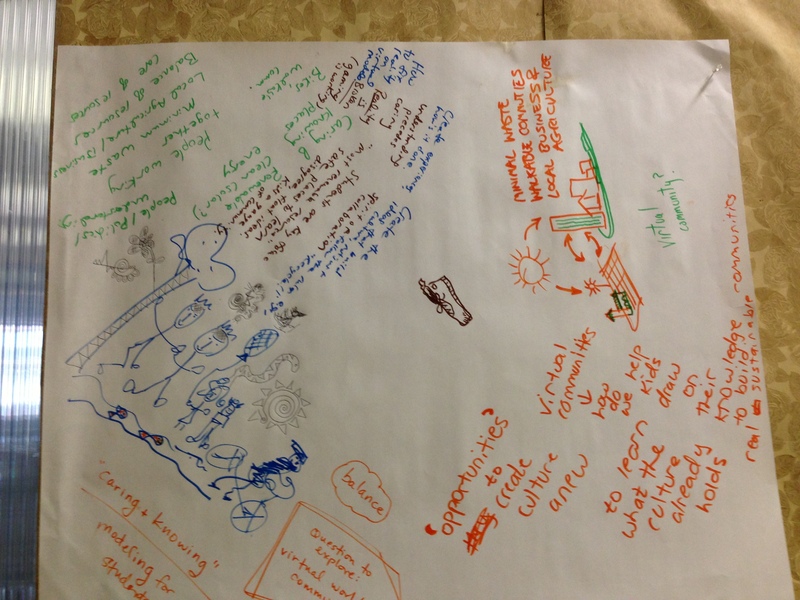 What is the role of a school in creating and promoting a sustainable community? What abilities and opportunities do students need to participate in a building sustainable communities? Conversations were rich and often student-centered. Several of us who are high school teachers or parents looked to the world of gaming, which engages are kids so deeply, with a curiosity about what do game designers know that we don’t, and how can we engage kids in service in comparable ways. I encouraged people to take inspiration from the work of Jane McGonigal and her book, Reality is Broken; I’ve embedded her TED talk below. At each table, and we each rotated among the tables for each topic, notes were taken on a paper table-cover, and then hung. I’ve shared a couple of them below. The last event of the morning was an extended CFG tuning protocol, with the choice of a middle school or high school project. Sadly it wasn’t possible to do both; I attended the high school session, dedicated to a Thanksgiving curriculum unit entailing multiple strands, including myths and realities of US History and Native American history, local issues of food security, community gardening, and Food Bank policies, and developing skills around desert and urban gardening, culinary arts, and event management. It is important I respect the confidentiality of the discussion here, but I think I am ok saying the purpose of the discussion was to consider how student engagement and motivation might be deepened, how the problems they were confronting might be made more meaningful and immediate to students, and how to make the various pieces fit into a learning experience more coherent and deep? The tuning protocol was carefully, if a bit hurriedly, applied (and I say that because I had much I wanted to share but couldn’t be squeezed into the time), and many great suggestions were made, with examples including connecting to local Native American educators for interviews and presentations, and working to tie the historical dynamics from early colonial days to contemporary food political issues with the corporatization of US Agriculture. It is so important to let go a little bit as a teacher and practice letting students take on the problem and develop their own approaches in diverse ways rather than overly directing them to what the problem is and what the options for approaches might be. After a very fine lunch (baked kale! 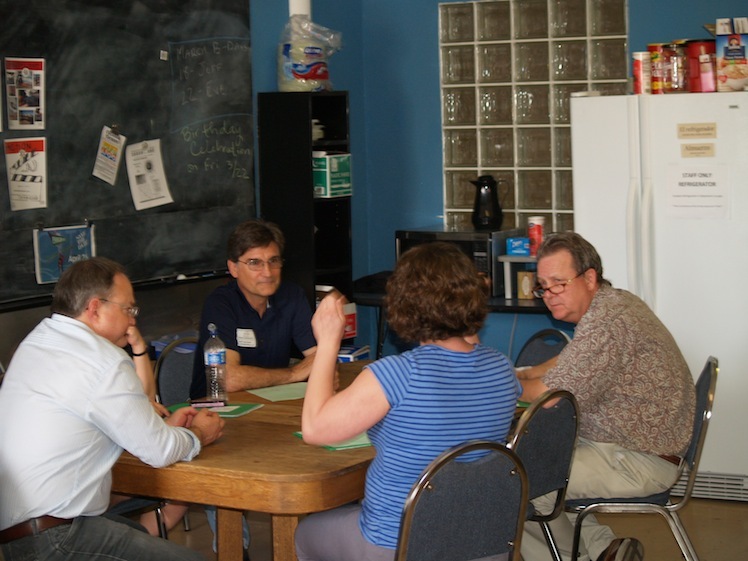 ), we returned to small groups, with each group welcoming two members to share a problem for feedback and suggestions. Love the focus on problems first. Let’s begin the conversation and advance our understanding not by listening to someone else’s good ideas and considering how/when/why we might employ them, but begin with establishing the problem, deepen first our understanding of the problem, and then seek out and welcome the suggestions and knowledge which is shared to apply to the problem at hand. In my group, and I hope I am not trespassing confidentiality, we discussed two such problems. In one, an after-school teacher described his video-game design workshop, and the issue he has that while some students are entirely motivated and engaged, others become distracted and diverted, off-task and off-track, and he wonders how he should best keep them working. Our conversation covered a lot of terrain, including querying whether this was a problem at all, considering how we might apply the Mimi Ito HOMAGO framework to these students’ activities– asking students to clarify to themselves and us whether they hanging out, messing around, or geeking out?– to how we can provide less experienced game designers more on-ramps and differentiated experiences to give them a sense of momentum which at first might be stymieing them. Our second “problem” was the ever-present question in our schools about how we might deepen and broaden how we embed our schools’ core values into the life of our school, and in particular those outside of regular class activities. At City High School, the Habits of Heart and Mind are Perspective, Inquiry, Action, Evidence, Expression, Reflection. I’d never given much thought to the opportunity of developing a virtual community, but now I’m fascinated about joining such online networks, being inspired by the attraction virtual learning communities have to kids. Meaningful learning—letting students take on the problem and develop their own approaches in diverse ways rather than overly directing them to what the problem is and what the options for approaches might be. The Challenge of communication, and lack thereof, issues, with all this service learning: you have to have a support structure. Sometimes I feel like Math is so separate from all this but today my brain was very engaged in thinking of ways to get service learning into math. I used to think that service learning is so easy for everyone else and so hard for me but not I know It is hard for everyone. 2 big aha moments—why not start every unit with clarifying with students: what do you already know about this and what do you want to know about this? Place-based education is sustainable education. I appreciate seeing the connection more between place-based learning and service learning. I enjoyed hearing about service learning in different contexts. Changing and expanding the concept of “student voice” to full participation—autonomous agency in learning process—that is a big change which I want to think about and learn much more about. My thanks to all the good people at City High School and to Joe Brooks of Community Works Institute for a great day. (Photo credits go to Joe as well). Love this post. I think service learning can be so mutually beneficial. It can address a real community need, and it can advance learners abilities to problem find, empathize, partner, and collaboratively address issues as co-citizens. In Synergy 8, @jgough and I relied on “observation journals” to generate place-based PBL ideas with our learning team (24 8th graders, Jill, and me). These journals typically took the form of a smart phone photo, a question, and a researchable idea (about 50 words usually) uploaded to a shared email-enabled blog. Over time, we accumulated 100s of possible ideas and data mined and surveyed community to determine projects from the pool of possibilities. (It’s part of what I showed in my Ignite EduCon this year.) I hope this tactic might spur more problem finding in more of our schools.